it's here! 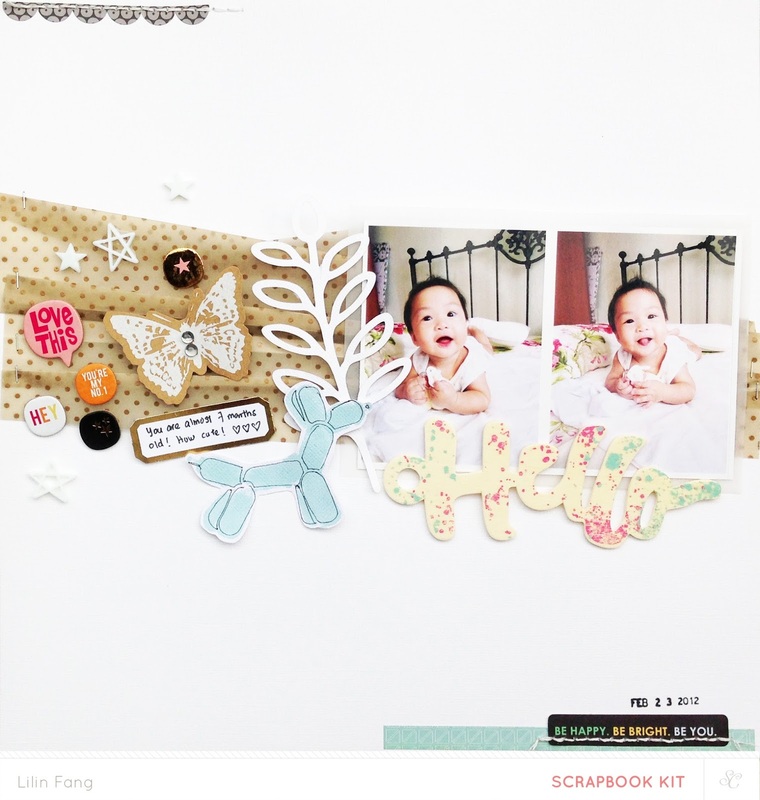 studio calico june kits - hello hello are here! i can't tell you how much i enjoyed working with the kits this month! 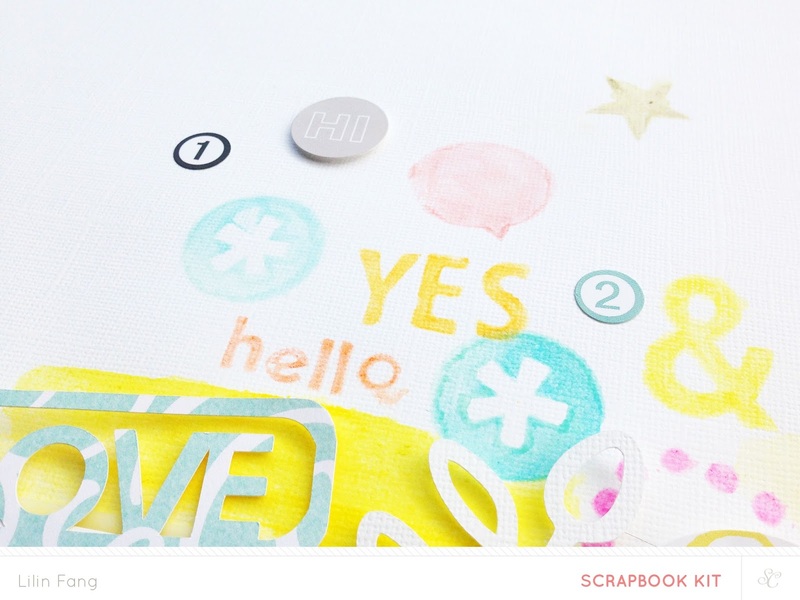 i am happy to work with the main scrapbook kit, hola (add on 1), ni hao (add on 2) and bonjour (add on 3). 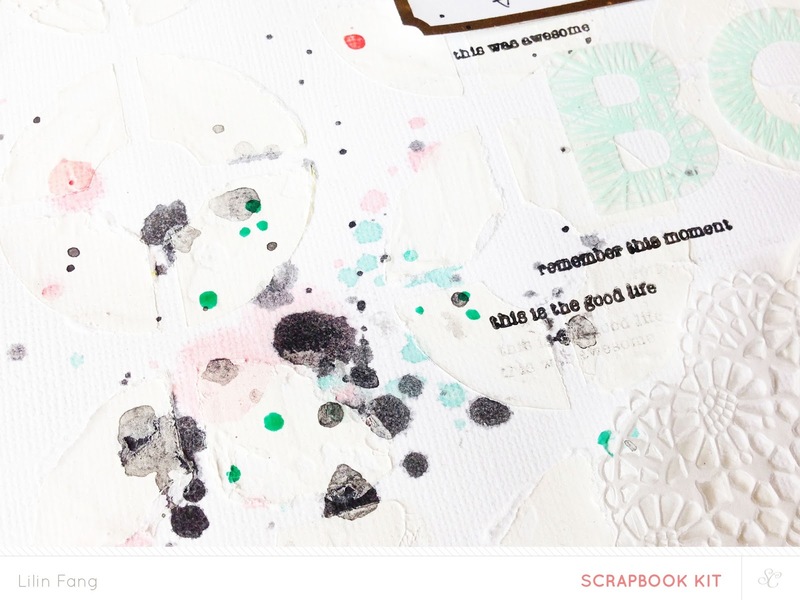 filled with pretty papers, foam stamps, acrylic paint, colorful gems, gold labels, acetate alpha and lots more, what's not to love about the main scrapbook kit???!!! it's my absolute favourite this month! let's take a look at what i made! i will be celebrating my fifth wedding anniversary this june so i created this page just to remember this special day. i am very much in love with origami now. i love how a square piece of paper can be folded into so many pretty shapes. this layout is inspired by an image i saw on pinterest on origami hearts. using the color scheme of the gems in the kit, i trim 5 patterned papers into squares and folded them into little hearts. next i used some watercolors and create a subtle rainbow background. 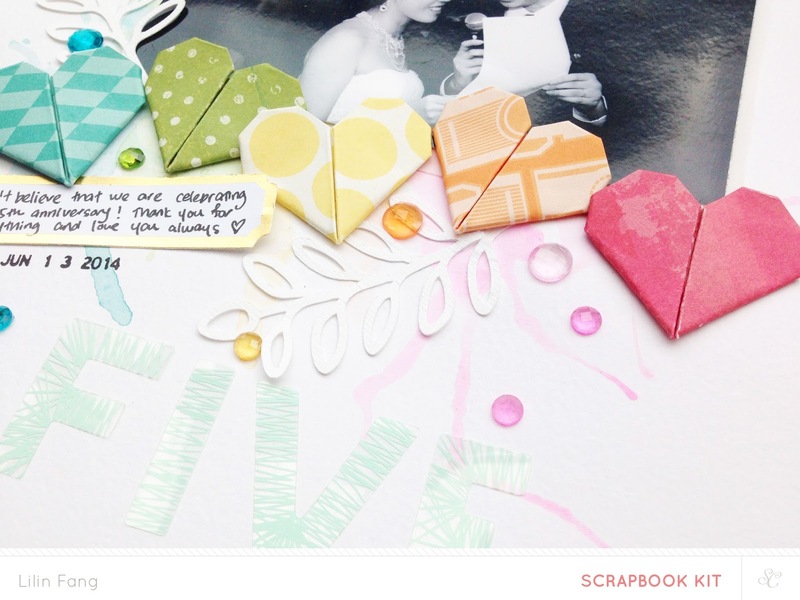 i layer my photo with vellum and place it on the rainbow and arranged the origami hearts to match the rainbow background. i kept my embellishments simple and added some die cut leaves by life love paper, gems, a gold label and the title. 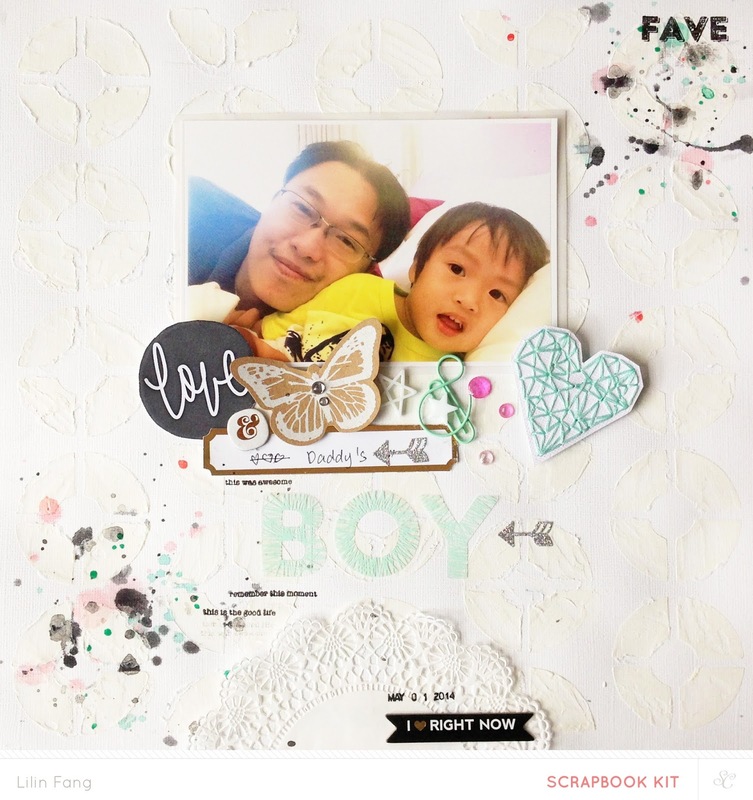 i had lots of fun playing with the foam stamps for this layout. i applied some gelatos on the stamp, blend it with a wet brush and stamp. love how soft and subtle the stamp images turn out. to make the photo stand out from the white card stock, i used yellow gelato to colour subtle background. next i layer my photo with a small piece of vellum and a die cut frame by in a creative bubble. i finished the page by adding my title, die cut leaves, some stickers, gold label for my journaling and date stamp. the card stock buckled a bit here so i stick it on a piece of patterned paper to stretch it out. i am inspired by one of wilna furstenburg's layout where she used folded vellum. 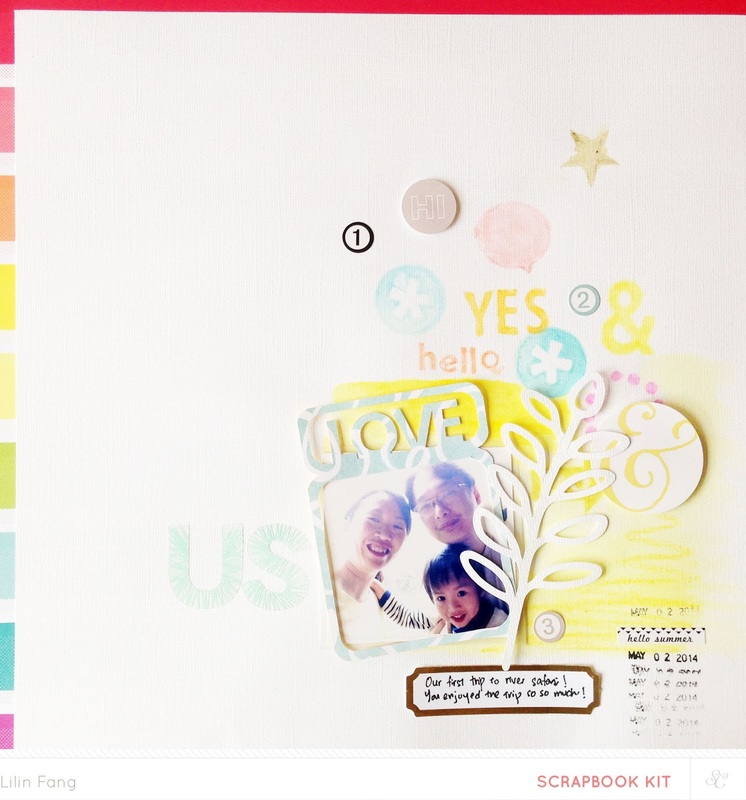 So for this layout, i folded the gold vellum paper in ni hao to create a layered background. after deciding where to place my photo, i added bits and pieces of embellishments from bonjour and my favourite die cut leaves (i cut a bunch of them using my silhouette cameo beforehand). i love the little balloon dog stencil in bonjour and wanted to add it to my page. i used the mr huey's dauber from last month's kit and coloured the stencil on a small piece of card stock. after colouring, the shape wasn't very clear so i placed the stencil on again and drew the outline with my pen. next i fussy cut the balloon dog and stick it on my page as an embellishment. at this point, i thought the top and bottom part of my page looked a bit plain so i added some stickers and some hand stitching for added interest. 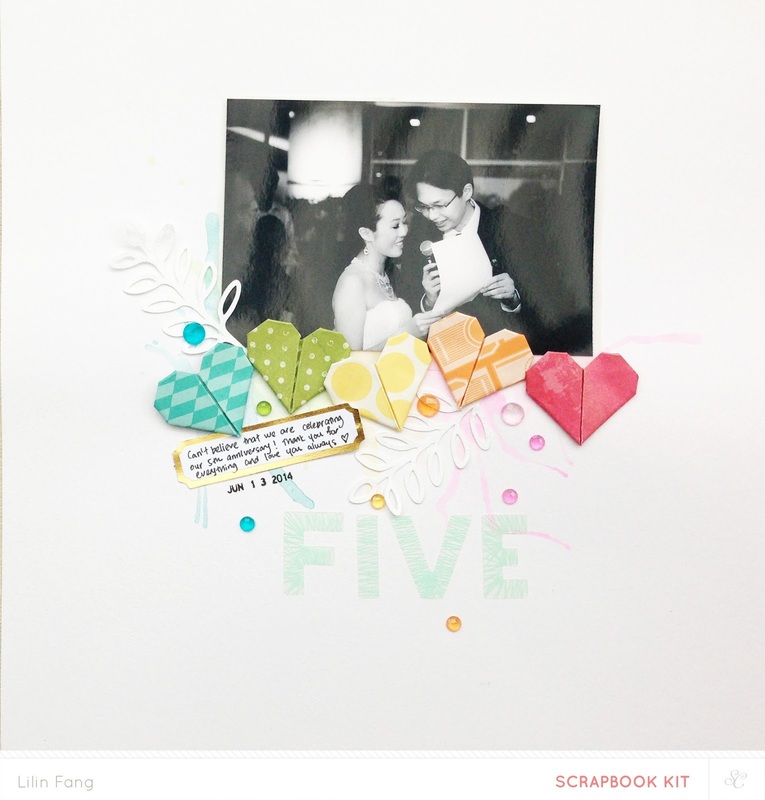 for this layout, i used this cut file designed by paige evans as a stencil. i used my silhouette cameo to cut the design on a piece of paper (you could use transparency if you would like to reuse the stencil). next, i place the stencil on a piece of white card stock and applied some gel medium + gesso mixture. gel medium is opaque so adding some gesso will make it white. after removing the stencil, i am left with a tone on tone textured background which i love! when i first saw the heart shaped digital stamp designed by in a creative bubble, i thought it will be fun to use it as a stitching stencil. i printed the digital stamp on a piece of paper and used it as a stencil. after stitching the design, i fussy cut the heart and used it as an embellishment for this page. after deciding the placement for my photo, i arranged my embellishments and title. to add more color and more of a mixed media feel to the page, i used mr huey's mist in seafoam, mary mary and inky black to create ink splatters. lastly, i finished the page with stamps included hola and my date stamp. i hope you have enjoyed my reveal of hello hello! if you love studio calico kits and would like to subscribe, click here and start your subscription with camelot! happy shopping and see you soon! The hearts on the Five layout are to die for!! !